The multidrug resistance (MDR) 1 gene encodes a 170-kDa membrane transporter called P-glycoprotein, which plays an important role in protecting cells against lipophilic xenobiotics by the way of an ATP-dependent cellular efflux mechanism. Three polymorphisms of MDR1, 3435C > T located in exon 26, 1236C > T in exon 12 and 2677G > T/A in exon 21 were the most extensively studied and were identified functionally important and ethnically diverse mapping to the gene region. Considering the potential influence of altering MDR1 activity, it is plausible that MDR1 polymorphisms might play a role in the development of cancer. Although the effects of MDR1 polymorphisms on susceptibility to human cancer have been investigated in many studies, the results still remain conflicting. To resolve these conflicts, we performed a quantitative synthesis of the association between these three polymorphisms and cancer risk, including 52 studies (15789 cases and 20274 controls) for 3435C > T polymorphism, 10 studies (2101 cases and 2842 controls) for 1236C > T polymorphism and 18 studies (3585 cases and 4351 controls) for 2677G > T/A polymorphism. The stratified analyses for 3435C > T polymorphism, individuals with T-allele in 3435C > T had significantly higher ALL risks (TT versus CC: OR =1.286, 95% CI =1.123-1.474); significantly elevated risks were observed among Caucasian populations (TT versus CC: OR =1.276, 95% CI =1.112-1.464). When restricting the analysis to the source of controls, we found that HB (hospital-based) genetic models had higher risks (TT versus CC: OR =1.307, 95% CI =1.046-1.632), as well as in PB (population-based) genetic models (TT versus CC: OR =1.294, 95% CI =1.079-1.55). The T/A-allele frequency of 2677G > T/A polymorphism was associated with higher risk of cancer (TT + TA + AA vs. GG: OR =1.348, 95% CI =1.031-1.762), significantly elevated risks were observed among Asian populations (TT + TA + AA vs. GG: OR =1.642, 95% CI =1.340-2.012), and elevated risks could be associated with PB models (TT + TA + AA vs. GG: OR =1.641, 95% CI =1.018-2.646). Our meta-analysis suggested that 3435C > T polymorphism and 2677G > T/A polymorphism were associated with cancer risk when all studies were pooled together, while 1236C > T polymorphism not. The human multidrug resistance 1 (MDR1 or ABCB1) gene encodes a 170-kDa membrane transport protein called P-glycoprotein. For minimizing the exposure of potential toxic compounds to the cellular homeostasis, P-glycoprotein is expressed primarily in regions that act as epithelial barriers or perform excretory functions, including blood-tissue barrier, the gastrointestinal tract, liver and kidney. Therefore, P-glycoprotein can play the role of sweeper by extruding several exogenous and endogenous substances, using ATP-dependent efflux pump [1–4]. The alteration of the cellular defense mechanism mediated by P-gp has been speculated to be closely associated with the development of various cancers including hepatocarcinoma, colorectal carcinoma, acute lymphoblastic leukemia and gall bladder tumors [5–8]. These suggest that MDR1 may play an important role in the elimination of carcinogens, and the mutation of MDR1 may lead to human malignancies . Several studies try to prove the causal function of P-gp in tumorigenesis by animal experiments. One study by Mochida Y et al. suggested that the absence of the P-gp role suppressed the development of intestinal neoplasia in Apc (Min/+) mice, and a P-gp inhibitor was found to suppress tumorigenesis in rats subsequently [9, 10]. While Schinkel et al. conducted a study comparing normal MDR1 a (+/+) mice (MDR1 a is the mouse equivalent to the human MDR1 gene) to constructed MDR1 a (−/−) disrupted mice to find that the MDR1 a (−/−)mice resulted in cumulative toxicity of the pesticide, ivermectin due to decreased extrusion of these compounds . Considering these data, we can infer that genetical absence of Pg-p expression may result in more exposure to environmental xenobiotics so that increased opportunity linked to the risk of malignancy was obtained. However, the causal relationship between MDR1 and the tumorigenesis has not been fully elucidated yet. Recently, at least 50 single-nucleotide polymorphisms have been reported within MDR1 gene locus [12, 13]. Among the systematic screens of this gene, Hoffmeyer et al. reported significant role that a synonymous SNP played at position 3435 located in exon 26 in the P-glycoprotein function . Recent studies have found that C3435T was in linkage disequilibrium with two other common SNPs, the synonymous C1236T (exon 12) and nonsynonymous triallelic G2677T/A (exon 21) [15–17]. Considering the potential influence of these SNPs, many molecular epidemiological studies were conducted to investigate the association between these SNPs and cancer risk in humans. However, the results from different studies are to some extent divergent, but nevertheless intriguing, which may be owing to limitations in individual studies. To clarify this issue, we performed a meta-analysis with subgroup analysis from all eligible studies focusing on 3435C > T, 1236C > T and 2677G > T/A, to obtain a more precise estimation of the relationship between polymorphisms and cancer risk. All case–control studies on the association between MDR1 polymorphisms and cancer risk published up to November 30, 2012 were identified through comprehensive searches using the PubMed and Medline database, ScienceDirect database, Springerlink database, Wiley Online Library, BioMed Central, Nature Series, Science Online, Cell Press Journals, CNKI, WanFang database with the following terms and keywords: “MDR1,” “ABCB1,” “single-nucleotide polymorphism,” and in combination with “leukemia,” “cancer,” “tumor” and “carcinoma.” The search was limited to human studies. In addition, we have especially reviewed the references cited in checked articles and identified some additional articles missed by the searching. The following criteria were used for the study selection: (1) a case–control study evaluating at least one of these three polymorphisms (3435C > T, 1236C > T and 2677G > T/A) and cancer risk; (2) studies with full-text articles; (3) no overlapping data. and (4) sufficient data for estimating an odds ratio (OR) with 95% confidence interval (95% CI). Information was carefully extracted from all the eligible publications. The following data were collected from each study: first author’s name, publication date, country, ethnicity, cancer type, source of controls (population-based [PB] or hospital-based [HB] controls), genotyping method, total numbers of cases and controls and number of cases and controls for each MDR1 polymorphism. Meanwhile, different case–control groups in one study were considered as independent studies. For each study, we did not define a minimum number of patients for inclusion in our meta-analysis. polymorphisms were estimated for each study. In our study, the C- allele, C-allele and G-allele were considered the reference genotypes, respectively in 3435C > T, 1236C > T and 2677G > T/A. The pooled ORs were performed for co-dominant model (TT vs. CC and TC vs. CC, TT + TA + AA vs. GG and GT + GA vs. GG), dominant model (TC + TT vs. CC, TT + TA + AA + GT + GA vs. GG) and recessive model (TT vs. TC + CC, TT + TA + AA vs. GT + GA + AA), respectively. Heterogeneity assumption was checked by a χ 2-based Q-test. A p-value of >0.05 for the Q-test indicated a lack of heterogeneity among studies, so that the pooled OR estimate of each study was calculated by the fixed-effects model (the Mantel–Haenszel method). Otherwise, the random-effects model (the DerSimonian and Laird method) was used. Heterogeneity was quantified with the I2 metric, which is independent of the number of studies in the meta-analysis (I2 < 25%: no heterogeneity; I2 = 25–50%: moderate heterogeneity; I2 = 50–75%: large heterogeneity, I2 > 75%: extreme heterogeneity). Subgroup analyses were performed by cancer type (if one cancer type contained fewer than three individual studies, it was combined into an “other cancers” group), ethnicity and source of controls. Before analysis for each study, we examined whether the genotype distribution of controls was consistent with Hardy– Weinberg equilibrium using the χ 2 test. We performed One-way sensitivity analysis by deleting a single study in the meta-analysis each time to reflect the influence of the individual data set to the pooled OR to assess the stability of the results. An estimate of potential publication bias was carried out by the funnel plot, in which the standard error of log (OR) of each study was plotted against its log (OR). An asymmetric plot suggests a possible publication bias. Funnel plot asymmetry was assessed by the method of Egger’s linear regression test, a linear regression approach to measure funnel plot asymmetry on the natural logarithm scale of the OR. The significance of the intercept was determined by the t-test suggested by Egger (p < 0.05 was considered a significant publication bias). All of the statistical tests used in our meta-analysis were performed by SPSS version 13.0 and STATA version 11.0 (Stata, College Station, TX). A total of 48 publications with 52 case–control studies exploring the association between MDR1 3435C > T, 1236C > T and 2677G > T/A polymorphisms and cancer risk were found [2, 5, 18–62]. Hence, as summarized in Table 1, 52 studies (15789 cases and 20274 controls) for 3435C > T polymorphism, 10 studies (2101 cases and 2842 controls) for 1236C > T polymorphism and 18 studies (3585 cases and 4351 controls) for 2677G > T/A polymorphism were selected in the meta-analysis, of which one publications had three independent studies and were considered separately. As summarized in Table 1, there were 25 hospital-based studies and 26 population-based studies. There were 8 acute lymphoblastic leukemia (ALL) studies, 14 colorectal cancer studies, 9 breast cancer studies, 4 gastric cancer studies, 3 renal cell cancer studies, 2 acute myelocytic leukemia (AML) studies, 2 lung cancer study, 2 B-cell chronic lymphocytic leukemia (CLL) studies, one endometrial cancer study, one esophageal squamous cell carcinoma study, one glioma study, one upper aerodigestive tract (UADT) cancers study, one multiple myeloma study, one leukemia study, one plasma cell myeloma study and one study with Hodgkin’s lymphoma (HL). Thirty-three studies were conducted in Europeans, seventeen studies were conducted in Asians. Two of the remained studies were conducted in Americans, and the other was in Mexicans. These studies indicate that the distribution of genotypes in controls was consistent with Hardy–Weinberg equilibrium. And the subjects of controls were matched for age and gender. Most of the cases were confirmed histologically or pathologically. Abbreviations: HB: hospital-based; PB: population-based; PCR-RFLP: polymerase chain reaction-restriction fragment length polymorphism; MAF: minor allele frequency; APEX: arrayed primer extensions. There was a wide variation in the T-allele and T/A-allele frequency of 3435C > T, 1236C > T and 2677G > T/A polymorphism between the two major ethnicities. For Asians, the T- allele frequency of 3435C > T was 25.52% (95% CI =23.84–27.21%), which was significantly higher than that in Caucasians (24.28%, 95% CI = 20.54–28.03%, p < 0.001). There was no statistical difference for the T- allele frequency of 1236C > T between Asians (24.28%, 95% CI = 11.37–26.56%) and Caucasians (36.11%, 95% CI = 27.74–44.47%, p =0.633). And for Asians (23.47%, 95% CI = 19.78–25.96%) whose T/A-allele frequency of 2677G > T/A polymorphism was not equivalent as Caucasians (22.87%, 95% CI = 11.12–35.82%, p =0.633). Tables 2 summarizes the main results of the meta-analysis for MDR1 3435C > T polymorphisms. Overall, we found that individuals with T-allele in 3435C > T had a higher risk of cancer (co-dominant model TT versus CC: OR =1.286, 95% CI =1.123–1.474; CT versus CC: OR = 1.126, 95% CI = 1.020–1.244; dominant model TT + CT versus CC: OR = 1.176, 95% CI = 1.068–1.295; recessive model TT versus CT + CC: OR =1.191, 95% CI =1.065–1.333). In the subgroup analysis by cancer type, the results indicated that individuals with T-allele in 3435C > T had significantly higher ALL risks (TT versus CC: OR =1.890, 95% CI =1.177–3.037), otherwise no significant association was found between higher CRC risks and T-allele in 3435C > T, neither was between breast cancer and T-allele in 3435C > T. When stratified by ethnicity, significantly elevated risks were observed among Caucasian populations(co-dominant model TT versus CC: OR =1.276, 95% CI =1.112–1.464; CT versus CC: OR = 1.172, 95% CI = 1.047–1.313; dominant model TT + CT versus CC: OR = 1.212, 95% CI = 1.083–1.357), whereas significantly elevated risks were not observed among Asian populations (co-dominant model TT versus CC: OR =1.314, 95% CI =0.894–1.933). When restricting the analysis to the source of controls, we found that HB genetic models had higher risks (TT versus CC: OR =1.307, 95% CI =1.046–1.632; dominant model: OR =1.170, 95% CI =1.009–1.357), and association was detected in PB genetic models also (TT versus CC: OR =1.294, 95% CI =1.079–1.552; CT versus CC: OR = 1.150, 95% CI = 1.019–1.299; dominant model TT + CT versus CC: OR = 1.459, 95% CI = 1.246–1.709; recessive model TT versus CT + CC: OR =1.183, 95% CI =1.033–1.355) (Figure 1). 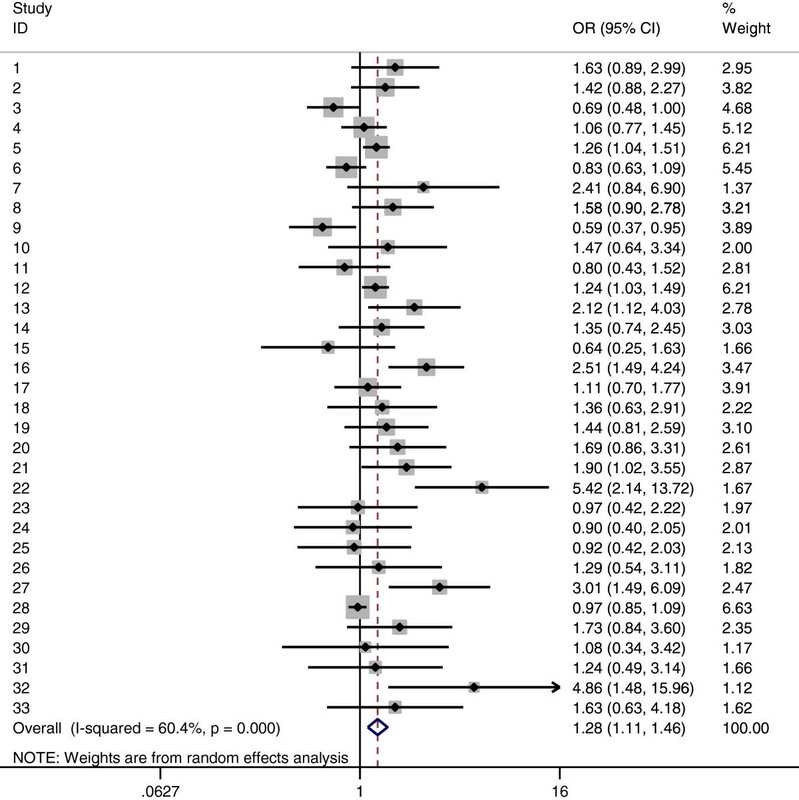 Forest plot of cancer risk associated with the MDR1 3435C > T polymorphism (TT vs. CC, random effects). The squares and horizontal lines correspond to the study-specific OR and 95% CI. The area of the squares reflects the study-specific weight (inverse of the variance). The diamonds represent the pooled OR and 95% CI. We also found that T/A-allele frequency of 2677G > T/A polymorphism was associated with higher risk of bearing cancer (2677G > T/A: TT + TA + AA vs. GG: OR =1.348, 95% CI =1.031–1.762; dominant model: OR = 1.161, 95% CI = 1.051–1.281; recessive model: OR = 1.278, 95% CI =1.022–1.597). In the subgroup analysis by ethnicity, significantly elevated risks were observed among Asian populations (co-dominant model TT + TA + AA vs. GG: OR =1.642, 95% CI =1.340–2.012; dominant model: OR = 1.273, 95% CI = 1.101–1.471; recessive model: OR = 1.481, 95% CI = 1.244–1.763), however no significantly elevated risks were observed among Caucasian populations. When stratified by the source of controls, we couldn’t find association between HB genetic models and higher cancer risks, but elevated risks could be associated with PB models (TT + TA + AA vs. GG: OR =1.641, 95% CI =1.018–2.646; GA + GT vs. GG: OR =1.164, 95% CI =1.008–1.345; dominant model: OR = 1.284, 95% CI =1.122–1.470). The combined result based on all studies showed that there was no statistically significant link between cancer risk and 1236C > T (1236C > T: TT vs. CC: OR =1.325, 95% CI =0.824–2.133; CT vs. CC: OR = 1.133, 95% CI = 0.817–1.573; dominant model: OR = 1.173, 95% CI = 0.825–1.688; recessive model: OR = 1.191, 95% CI =0.840–1.690) (Table 2). For 3435C > T polymorphism, there was substantial heterogeneity among these studies for homozygote comparison (TT vs. CC: p heterogeneity = 0.000), and recessive model comparison (TT vs. CT + CC: p heterogeneity < 0.001). Then, we assessed the source of heterogeneity for homozygote comparison (TT vs. CC) by ethnicity, cancer type and source of controls. We found that cancer type (χ 2 = 18.51, df = 2 and p < 0.001), ethnicity (χ 2 = 9.58, df = 1 and p = 0.002) and the source of controls (χ 2 = 4.42, df = 1 and p = 0.036) all contributed to substantial heterogeneity. Although the sample size for cases and controls in 52 studies ranged from 38 to 5,486, the corresponding pooled ORs were not qualitatively altered with or without the study of small sample. Similarly, no other single study influenced the pooled OR materially as indicated by sensitivity analysis. And for 2677G > T/A polymorphism, there was also heterogeneity for homozygote comparison (TT + TA + AA vs. GG: p heterogeneity = 0.000), recessive model comparison (p heterogeneity < 0.001). The heterogeneity we decided to analyze was homozygote comparison (TT + TA + AA vs. GG). Due to cancer type (χ 2 = 20.14, df = 7 and p = 0.005) and the source of controls (χ 2 = 14.53, df = 1 and p < 0.001), but not the ethnicity (χ 2 = 1.28, df = 1 and p = 0.258). 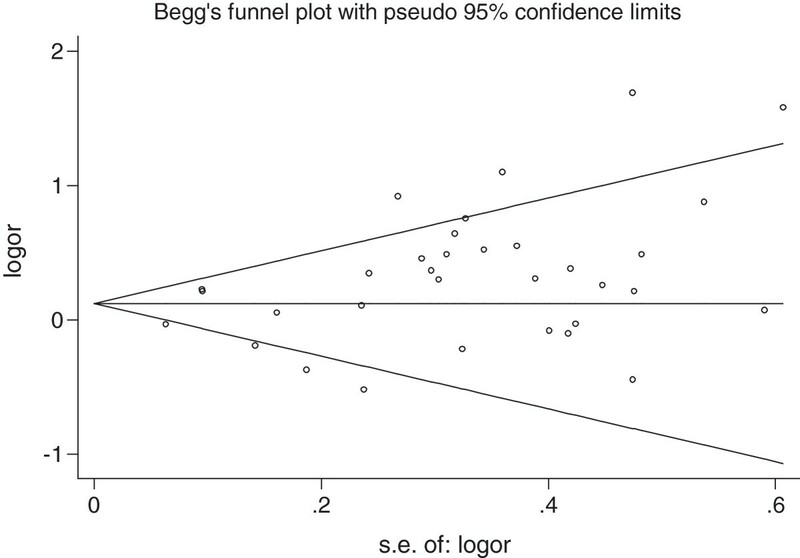 We performed Begg’s funnel plot and Egger’s test to assess the publication bias of literatures. As shown in Figure 2, the shape of the funnel plots did not reveal any evidence of obvious asymmetry. The results of Egger’s test still did not suggest any evidence of publication bias for 3435C > T polymorphism (p =0.085 for TT vs. CC, p =0.273 for CT vs. CC, p = 0.102 for dominant model, respectively and p = 0.176 for recessive model). There are neither Publication bias for 1236C > T polymorphism (p =0.247 for TT vs. CC, p =0.208 for CT vs. CC, p = 0.215 for dominant model, respectively and p = 0.332 for recessive model), nor for 2677G > T/A polymorphism (p =0.716 for TT + TA + AA vs. GG and p = 0.656 for recessive model, p =0.841 for GT + GA vs. GG, p = 0.971 for dominant model, respectively). Begg’s funnel plots for publication bias test (3435C > T TT vs. CC). Each point represents a separate study for the indicated association. Log (OR), natural logarithm of OR. Horizontal line, means effect size. ATP-binding cassette (ABC) is one of the largest families of active importers and exporters that are located mainly in tissues acting as a barrier or having an excretory function. Most of the ABC transporters play a role in cell defense against environmental attacks generated by xenobiotics and intraceullar metabolic waste. The multidrug resistance 1 (MDR1/ABCB1) gene codes for P-glycoprotein, a membrane-bound transporter. Various cytokines, such as interleukin-1beta, benzo [a]pyrene and chemokines involved in inflammation seem to be the substrates of P-glycoprotein, which leading P-glycoprotein to be a potential cause of inflammation-induced carcinogenesis. MDR1 also seems to play a role in preventing early apoptosis in tumor cells. Significant MDR1 gene heterogeneity, namely multiple mutations in the ABCB1/MDR1 gene has been demonstrated in previous studies. Analysis of all 28 exons of the ABCB1/MDR1 gene demonstrated at least 48 single-nucleotide polymorphisms (SNPs) to date, including promoter and the intron–exon region. The most frequent SNP MDR1 2677G > T/A in exon 21 (RefSNP ID: rs2032582), leads to amino acid exchange from Ala to Ser or Thr. The silent mutation in exon 26 MDR1 3435C > T (RefSNP ID: rs1045642) is associated with altered protein function. The third common polymorphism of ABCB1/MDR1 gene is a silent mutation in exon 12 MDR1 1236C > T (RefSNP ID: rs1128503). These three polymorphisms are closely related to linkage disequilibrium (LD). It was suggested that SNP is connected with susceptibility to many cancer types, such as renal epithelial tumors and acute lymphoblastic leukemia and CRC. Our results showed that MDR1 3435C > T polymorphism is associated with cancer risk when all studies were pooled together (TT versus CC: OR =1.286, 95% CI =1.123–1.474; CT versus CC: OR = 1.126, 95% CI = 1.020–1.244; dominant model TT + CT versus CC: OR = 1.176, 95% CI = 1.068–1.295; recessive model TT versus CT + CC: OR =1.191, 95% CI =1.065–1.333). In the stratified analysis by cancer type, the results indicated that individuals with T-allele in 3435C > T had significantly higher ALL risks (TT versus CC: OR =1.890, 95% CI =1.177–3.037; TT + CT versus CC: OR = 1.240, 95% CI = 1.046–1.470; recessive model TT versus CT + CC: OR = 1.829, 95% CI =1.095–3.054), otherwise no significant association was found between higher CRC risks and T-allele in 3435C > T, neither was between breast cancer and T-allele in 3435C > T. When stratified by ethnicity, significantly elevated risks were observed among Caucasian populations(co-dominant model TT versus CC: OR =1.276, 95% CI =1.112–1.464; CT versus CC: OR = 1.172, 95% CI = 1.047–1.313; dominant model TT + CT versus CC: OR = 1.212, 95% CI = 1.083–1.357), whereas significantly elevated risks were not observed among Asian populations (co-dominant model TT versus CC: OR =1.314, 95% CI =0.894–1.933). When restricting the analysis to the source of controls, we found that HB genetic models had higher risks (TT versus CC: OR =1.307, 95% CI =1.046–1.632; dominant model: OR =1.170, 95% CI =1.009–1.357), and association was detected in PB genetic models also (TT versus CC: OR =1.294, 95% CI =1.079–1.552; CT versus CC: OR = 1.150, 95% CI = 1.019–1.299; dominant model TT + CT versus CC: OR = 1.459, 95% CI = 1.246–1.709; recessive model TT versus CT + CC: OR =1.183, 95% CI =1.033–1.355). Inconsistent results might be attributed to the different roles MDR1 played in different cell types or tissues. We’ve found the association between MDR1 3435C > T polymorphism and ALL risk in subgroup analyses, as well as subgroup based on HB and PB genetic models. And in the stratified analysis by ethnicity, individuals carrying the T-allele in 3435C > T were significantly associated with elevated cancer risk in Asian as well as Caucasian populations compared with C-allele carriers. We also found that T/A-allele frequency of 2677G > T/A polymorphism was associated with higher risk of cancer (2677G > T/A: TT + TA + AA vs. GG: OR =1.348, 95% CI =1.031–1.762). In the subgroup analysis by ethnicity, significantly elevated risks were observed among Asian populations (co-dominant model TT + TA + AA vs. GG: OR =1.642, 95% CI =1.340–2.012), however no significantly elevated risks were observed among Caucasian populations. When stratified by the source of controls, we couldn’t find association between HB genetic models and higher cancer risks, but elevated risks could be associated with PB models (TT + TA + AA vs. GG: OR =1.641, 95% CI =1.018–2.646; GA + GT vs. GG: OR =1.164, 95% CI =1.008–1.345; dominant model: OR = 1.284, 95% CI =1.122–1.470). The combined result based on all studies showed that there was no statistically significant link between cancer risk and 1236C > T (1236C > T: TT vs. CC: OR =1.325, 95% CI =0.824–2.133; CT vs. CC: OR = 1.133, 95% CI = 0.817–1.573; dominant model: OR = 1.173, 95% CI = 0.825–1.688; recessive model: OR = 1.191, 95% CI =0.840–1.690). It should be considered that the apparent inconsistency of these results may be caused by differences in disease prevalence, lifestyle, as well as possible limitations due to the relatively small sample size. The current knowledge of carcinogenesis indicates it is a process developed step by step, as well as influenced by multiple factors that involve various genetic alterations and several signaling pathways. Thus, it is unlikely that risk factors of cancer work in isolation from each other. Besides, even the same polymorphisms may act distinct roles in each cancer type, for different genetic backgrounds may contribute to the cancer discrepancy. And more importantly, the appearance determined by polymorphisms may largely depend on synthetically interaction with each polymorphism or a particular environmental exposure. Thus, it is possible that the effects of DNA repair function on cancer risk may be modified by multiple genetic polymorphisms. Also should we consider the chance findings as another plausible reason for the inconsistency of the results. Although we have put considerable resources and efforts into discovering the association between MDR1 polymorphism and cancer risk as possible as we can, there still exists some limitations. First, when stratified by the source of controls, our results indicated that studies using hospital-based controls rather than population-based controls had a significantly increased risk. The reason may be that the hospital-based studies have some biases because such controls may contain certain other diverse diseases which can cause different risks of developing into cancer of various organs and may not be so representative as the general population. Therefore, using proper and more representative cancer-free control subjects are crucial for reducing biases in such case–control studies. Second, our results were based on single-factor estimates without adjustment for other risk factors such as age, smoking and drinking status, environmental factors and other variables, which might have caused serious confounding bias. Third, some inevitable publication bias might exist. Finally, the number of the published studies was not sufficiently large for a comprehensive analysis, particularly for the 1236C > T polymorphism. Hence we had to give up subgroup analysis for the polymorphism. For these limitations, our results should be interpreted with caution. Our meta-analysis also has several strengths. First, statistically, a systematic review of the association of MDR1 polymorphism between cancer risks is more powerful than any single study. Second, the quality of eligible studies included in current meta-analysis was satisfactory and met our inclusion criterion. Third, we did not detect sufficient publication bias indicating that the whole results might be unbiased. In conclusion, our meta-analysis suggests that the MDR1 3435C > T and 2677G > T/A polymorphism may contribute to genetic susceptibility of cancers. And the results support that the minor T-allele of the MDR1 3435C > T polymorphism is associated with a higher risk of acute lymphocytic leukemia, and significantly elevated risks were observed among Asian and Caucasian populations as well as HB and PB subgroups. And in the 2677G > T/A polymorphism, those who carry the T-allele and A-allele were associated with higher cancer risks among Asians and PB subgroup. However, it is necessary to conduct large sample studies using standardized unbiased genotyping methods, homogeneous cancer patients and well-matched controls. Moreover, further studies estimating the effect of gene–gene and gene–environment interactions may eventually lead to our better, comprehensive understanding of the association between the MDR1 polymorphism and cancer risk. The author would like to acknowledge the Guangdong Supporting Grant for Outstanding Talents (2001–12) that led to the writing of this work. The author declares that there are no competing interests and that this work has not been published or submitted concurrently for publication elsewhere. LHW contributed solely to the writing and submission of this work. All authors read and approved the final manuscript.